Barney McAll (born Melbourne, Australia, 1966) is a jazz pianist and composer. 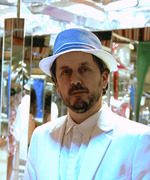 Barney McAll moved to New York City from Australia in 1997 to join saxophonist Gary Bartz's band. As well as remaining to be a member of the Gary Bartz quartet, he also plays with the Josh Roseman Unit, Fred Wesley and the JB's, Groove Collective, and Kurt Rosenwinkel's "Heartcore". He completed a Bachelor of Music at the Victorian College of the Arts in Melbourne, studying with pianists Paul Grabowsky, Tony Gould and Mike Nock and with guitarist Doug Devries. His ensembles include M.O.D.A.S, Sylent Running, GRAFT and his most recent ensemble ASIO (Australian Symbiotic Improvisers Orbit). He was awarded the prestigious fellowship from the Australia Council for the Arts in 2007, and has worked as musical director for Australian vocalist Sia Furler. Barney McAll is the 2015 recipient of the Peggy Glanville-Hicks composer residency in Sydney, Australia. He has recorded or performed internationally with many other musicians including Dewey Redman, Roy Ayers, Kenny Garrett, Maceo Parker, Jimmy Cobb, Eddie Henderson, Aloe Blacc, Peter Apfelbaum, Billy Harper, Daniel Merriweather and Vernel Fournier. At the ARIA Music Awards of 2015 McAll won Best Jazz Album for Mooroolbark. Trilogy of Cycles : jazz ensemble Commissioned by City of Melbourne.